Seborrheic dermatitis or seborrheic eczema is a skin condition that often affects young adults, although it can occur at any age. Around 1-3% of the adult population are affected, mostly in men. It can also affect babies, leading to a condition called cradle cap. The rash is accompanied by the presence of dandruff which is often treated by an anti-yeast shampoo or cream. However, the condition tends recur, thus necessitating regular use of antifungal products to keep it away. This skin condition tends to affect areas of the body that have the most oil-producing glands. Therefore, seborrheic dermatitis on face is very common. Symptoms include scaling, formation of dandruff, itchiness and flakiness of the skin. As the condition gets worse, a skin rash can also develop, which looks like patches of round/oval, red, greasy skin. The patches may vary in size, appear slightly raised, and may form yellow to brown crusts. Some people may also develop inflammation in the outer ear and the eyelids. 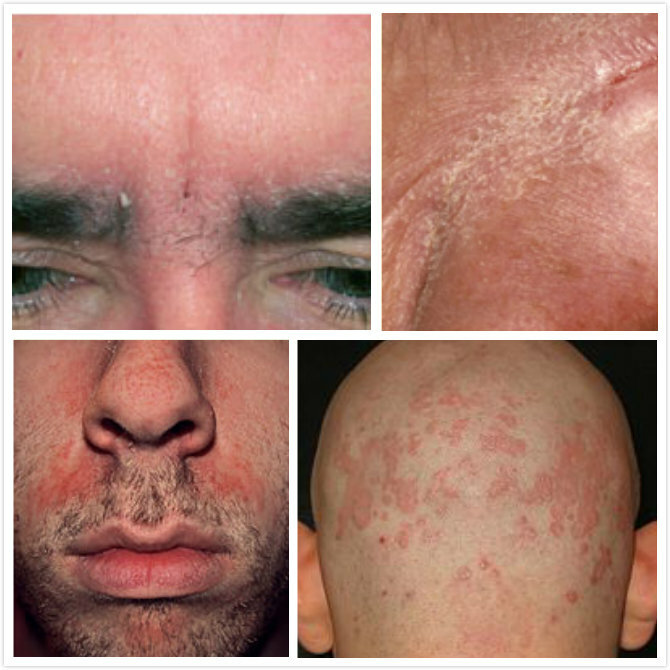 In severe cases of seborrheic dermatitis, face, neck, ears, scalp, chest, armpits, and groins are affected. This usually occurs in people who have weakened immune systems, such as those who have HIV/AIDS. It may be difficult to distinguish this from other skin conditions, so you must consult a dermatologist (a specialist in skin problems) to get proper diagnosis and treatment. For seborrheic dermatitis, face hygiene is important. Wash off excess oil and dead skin cells to reduce scales using mild soap to avoid irritating your skin. Avoid using alcohol-based products to clean the skin. Moisturize with non-oily, non-comedogenic products that will not clog the pores. It is best to consult your doctor before using any of these shampoos, especially if you are pregnant, and to follow instructions for use. Apply warm compress particularly if you have seborrheic dermatitis, face with scaly patches on the eyelids. Make a warm compress with wash cloth dipped in warm water. Place the warm compress over the eyelids until scales become soft and can be easily wiped away. Avoid peeling away the scales if they do not come off easily to reduce your risk of skin break or infection. To prevent further build-up of oil, keep your hair away from your face and shave off your moustache or beard. You can also try wearing a hat which can help absorb oil from your skin and scalp. Use over-the-counter medications to reduce inflammation and itching, fight infection and promote healing. These medications may include cortisone creams, antifungal creams and antibacterial creams. Consult your doctor about using these products if you are pregnant. It is important to treat itchy skin to prevent scratching which can lead to skin infection and inflammation. You can usecalamine lotion orhydrocortisone cream, but avoid using these continuously for long periods. Stress is sometimes related to hormonal changes and can make you prone to skin problems. It is therefore important to manage stress by learning some relaxation techniques, getting enough sleep, and getting more exercise. Aloe, which may come from a plant as a gel or from commercial preparations to soothe your skin. Fish oil supplements, which contain omega-3 fatty acids that are good for skin health. Tea tree oil, which has antiseptic properties that prevent infection and promote healing. Prescription-strength preparations containing hydrocortisone, desonide or fluocinolone to reduce inflammation. Antifungal shampoo with prescription-strength ketoconazole, which may be effective when used alternately with a product containing clobetasol. Oral antifungal medication such as terbinafine (Lamisil). This is not commonly used because of the possible serious side effects, including allergic reactions or liver problems. Medications that improve immune system function, such as creams and lotions containing pimecrolimus (Elidel) and tacrolimus (Protopic). Compared to corticosteroids, these are more effective and have fewer side effects. However, these are more costly and have been linked to an increased risk of cancer. Medicated creams or gels that contain metronidazole, which can fight bacterial infection. A combination of light therapy and oral medication (psoralen), which has been found to be effective for seborrheic dermatitis on face. These 12 Foods Can Cause Acne, Be Careful! How to Remove Splinters Under Your Fingernail? Shea Butter vs. Cocoa Butter, Which One Is Better?